My receiving all your namaskaras, without my performing namaskaras to any person, makes me think of my janma as empty and in vain. Our Acharya (Adi Sankara) has done a great good in this regard. What is that? 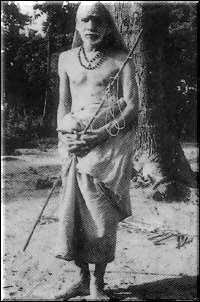 He has reminded that: "Sannyasis, like us, to whom you perform namaskaras, regarding them as saints, should never think that the namaskara belongs to us. It belongs only to the one Paramatma and Parasakthi which conducts and controls all the affairs of the jagat". Not stopping with that, he has also made a rule for us to follow, in order that we make sure of conveying your namaskara to the Paramatma and do not accept the namaskara ourselves in the thought that it belongs to us. The rule will look very easy to follow, at first sight.